Lovely dentist and staff. I am not nervous anymore. Thank you. Teeth which are badly discoloured, broken down or missing can sometimes be restored with a crown or a bridge. The tooth is filed down a little and an impression is taken to make the crown. 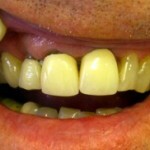 The crown is made from a gold alloy with porcelain fixed over this to match the colour and shape of the existing teeth. If a tooth is missing, the space can be filled by joining crowns together to make a bridge, which is permanently cemented into place.